Bicycle touring is gaining momentum as a popular and inexpensive way to travel -- traveling by bicycle is slow enough to get to know a place and its people, but fast enough to cover decent ground. This course covers the basics of bicycle travel, whether it be an overnight trip close-to-home, a week-long trip in the US, or a multi-month trip across the globe. The course covers everything from trip planning to gear selection and concentrates on supported, credit card, and self-contained styles of road bike touring. "I learned so much and I'm really excited to start touring. Yours was easily one of the best classes I've ever taken from the Experimental College." ~ R.L. "Thanks for the class. It gave me a lot of great ideas." ~T.W. "The class really exceeded my expectations and I am eagerly planning [my] Idaho Panhandle ride." ~W.M. "The class was great, really enjoyed it. It was a wealth of information…You encouraged me to take a trip by myself. The freedom to plan a trip and go when you want is a tremendous advantage." ~K.F. "Thank you so much for the excellent touring class…Your enthusiasm, love of cycling, experience and genuine desire to share that information with others comes through…Thanks again - you gave us all some very helpful information and tools." ~C.B. Sarah left the corporate world in 2012 to focus her energies on her passions, one of which is cycle touring. She has been on self-supported solo tours down the Pacific Coast and across the US, as well as a number of overnight adventures in the Seattle area. 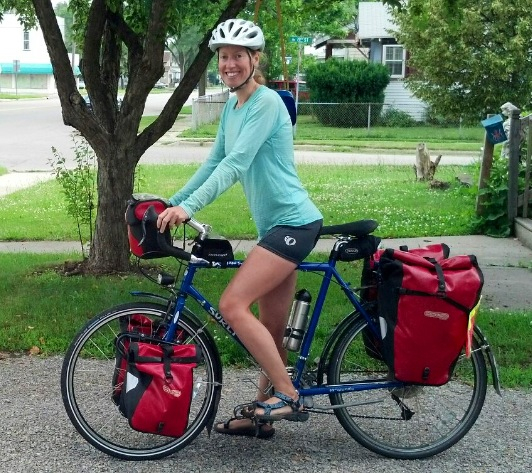 She loves sharing her cycle touring enthusiasm, knowledge, and experiences with other cyclists. At this time, there are no classes scheduled. If you are interested in having me teach this class for your organization, please contact me.